Eight Maids A Milking: 1 oz amaretto, 2 oz. white godiva chocolate, dab of whipped cream. 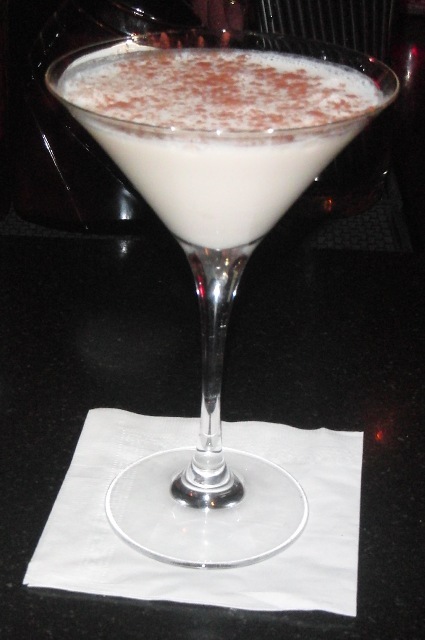 Shake/pour into martini glass and top with whipped cream and nutmeg. The very entertaining mixologist at the Ojai Valley Inn and Spa designed some magnificient holiday concoctions to delight guests during the festive season. They include: Six Geese a Laying; Fiivveee Golden Ringssssss; Four Calling Birds or Holiday Nightcap (Santa's); Three French Hens; Two Turtle Doves or Let it Snow; Partridge in a Pear Tree; Twelve Drummers Drumming or Mistletow Martini; Eleven Pipers Piping; Ten Lords a Leaping; Nine Ladies Dancing; Eight Maids a Milking; Seven Swans a Swimming. Each one is unique and as beautiful to the eye as the taste. Bryant Park Hotel in NYC offers colorful concoctions "Purple Snowflake Martini" and the New Years Eve "Silver Fireworks". Please take a look at the recipes and images below and let me know what you think! Pour all ingredients into shaker except the coconut flakes. Shake the concoction vigorously! Pour the mixture into a Martini glass and top with coconut flakes. One of many new treats at the Cafe Verde in the Ojai Valley Inn & Spa Resort is the Spa Tini, a beautiful and so-o delicious version of the martini, only it is made with healthier ingredients that assist in your slimming efforts. In a shaker, muddle 1" piece of chopped cucumber in tonic water. Add sake and rum. Shake vigorously. Strain into martini glass. Grnish with thin slice of cucumber floating on top.